My brother is my mother. Unusual for you humans perhaps, but for a seahorse it’s the norm. I’m a female. So while I do play my own part in the reproductive cycle, it’s the boys that are responsible for most of the work. 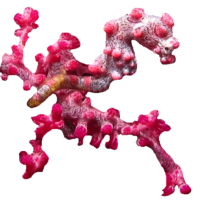 I’m a Pygmy Seahorse and I don’t live long. So I figured I’d better tell my story before I become another critter’s meal. I’m really quite unique. You only recently discovered my kind, and it was quite by accident. Samples of coral had been taken from the reef and placed in a tank for examination. Low and behold, a tiny little me was spotted hanging on by the tail. Only 3/4 inch high, and in perfect camouflage, it’s not really surprising you had never noticed us before. But now you know we’re here, divers are rushing to to try and catch a glimpse of us. Our lives aren’t all that different from the habits of our other seahorse cousins. So here’s the inside scoop…..
It’s unusual for seahorses to stick together, but we Pygmies will form small cluster colonies. So the chances are fairly good that should an eagle-eyed diver see one of us, more are nearby. As with most species, our story starts with a “boy meets girl” scenario. We Pygmies like to take our time to get to know each other. After a few days of flirting from a far, we get close and do our dance. We like to wrap our tails around each other, and change colour. A boy shows he is ready for a girl’s eggs by pushing water through his empty pouch. That’s my cue. I get in real close and release my eggs, just as he ejaculates. The fertilized eggs then embed themselves in the wall of the male’s pouch. He provides nutrients and oxygen to the embryos as they develop over several weeks. The exact time it takes for our babies to mature depends primarily on the temperature of the water. Warmer water means our babies grow faster. As any mother knows, contractions are not the most pleasant part of the parenting process. Fortunately for our seahorse men, birth is a relatively fast process. Our “fry” as you call them, are born extraordinarily tiny, but fully functional. Pygmy fry are amongst the smallest living things in the sea. Ironically, our Pygmy babies often have a higher survival rate when compared to the offspring of larger seahorses. Perhaps because we are able to blend into the background so well. Like adults, our young seek to attach themselves to something as soon as possible, using their tails. Occasionally, newborns will wrap their tails together to avoid being carried off all together. It’s unusual for seahorses to stick together, but we Pygmies will form small cluster colonies. So the chances are fairly good that should an eagle-eyed diver see one of us, more are nearby. Once we find a Gorgonian Coral, and anchor ourselves to it, we don’t move around much. We are far too small to negotiate currents, and we have evolved our colouring to perfectly mimic that of the coral. We feed slowly, often consuming baby brine shrimp. As we lack a digestive system, we need to keep eating constantly. When we are not eating, we rest, swaying gently in the pink branches of the coral trees we call home. We may become a meal for reef fish, crabs or rays if we are found. However, humans are by far the biggest threat facing all of us seahorses.